Dr. Robert Touro, faculty member in Trident’s Glenn R. Jones College of Business, is the recipient of the 2017 Trident Teaching Excellence Award. Dr. Robert “Bob” W. Touro, faculty member in Trident University International’s (Trident) Glenn R. Jones College of Business, is the recipient of the 2017 Trident Teaching Excellence Award. He was presented with the award at Trident’s 2017 Commencement Ceremony on July 22nd in Costa Mesa, CA. Trident’s Teaching Excellence Award is given out each quarter, and recipients are nominated and voted on by students. Dr. Touro was selected to receive this award from among 135 faculty members who were nominated by 235 students. Faculty leadership then reviewed student nominations from the past year for the winners of the quarterly awards. Based on this evidence, Dr. Touro was recommended to receive the first annual award. Quarterly winners over the past year include Dr. Touro; Dr. Mark Pieffer, Department Chair in Communications and Humanities, University College; Dr. Pattijean Hooper, Faculty, College of Health and Human Services; and faculty member Dr. Kenneth Cromer. “During his time at Trident, Dr. Touro has built a reputation for putting students first. This award is an acknowledgement of his tireless efforts to help everyone in his classroom succeed,” stated Dr. Mihaela Tanasescu, Provost and Chief Academic Officer at Trident University. Dr. Touro, who started teaching at Trident in 2015, instructs primarily in the Bachelor’s of Science in Business Administration program. 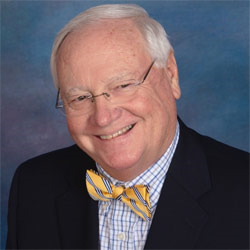 His professional experience spans 40 years in the business world where he developed a reputation as a generalist with experience in multiple industries. He has held roles in finance, accounting and credit management, international sales, and marketing in both management and executive capacities. Retiring from the corporate world in December 2015, Dr. Touro last served as Vice President, Marketing and Business Development, for Jacksonville, FL based Cybermax, Inc. Cybermax is a web solutions company developing E-Business and E-Learning solutions for manufacturers, distributors, retailers, associations and others engaged in conducting business using the Internet (B2B/B2C – via Internet, Intranets and Extranets). Dr. Touro earned a Doctor of Management degree with a concentration in Emerging Media from Colorado Technical University in 2015. He earned a Master of Arts in Education with a concentration in Adult Learning and Distance Education from the University of Phoenix, and pursued MBA coursework at University of Massachusetts, Dartmouth. Trident is a 100% online university and is regionally accredited by the WASC Senior College and University Commission (WSCUC). Active duty military, veterans, National Guard, and military dependents make up 79% of the University’s student population, and Trident is proud to employ many veterans at its faculty, staff, and management levels.